Every year the E.W. 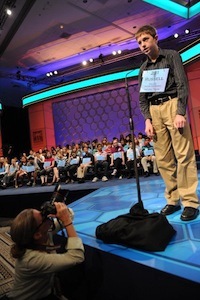 Scripps Company conducts the National Spelling Bee in the Nation’s Capital. This year the event moved just outside the beltway to the Gaylord Convention Center at National Harbor. Hundreds of kids compete from all around the nation. This interests local news TV stations and NBC NewsChannel assists affiliates by coverering the events and interviews participants as they progress through the competitive rounds. Again, Peter Roof helped in this coverage. Also new this year: two Panasonic HPX500 cameras were used, one on the stage and the other shooting b-roll and interviews. Material was fed back to the Washington bureau via fiber either from the interview camera live or a P2 player. The new venue allowed for a little more space to setup without getting caught up in the crowds or with other crews.